Yesterday I was sad to read of the death of Oliver Sacks and today I wanted to share some of the letters I wrote to Dr. Sacks and these letters were all since November of 2014 when I was prompted to answer the arguments of the film series “Renowned Academics Speaking About God,” which Dr. Sacks was a part of. In this 1995 interview, famed neurologist and author Oliver Sacks talks about the perils of profiling people, his friendship with Robin Williams (who played him in the film “Awakenings”), his wariness of technology, an island where 10% of the population can’t see color, and his wonder over our “unimaginably complex and beautiful” brains. Unedited..camera A Robin Williams in NYC talking with Jimmy Carter about the film Awakenings.. Penny Marshall directed and Robert Deniro was his co star. Serious route for this funny man…but hes great at that too! 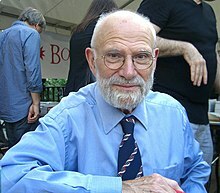 Oliver Wolf Sacks, CBE (born 9 July 1933) is a British-American neurologist, writer, and amateur chemist who is Professor of Neurology at New York University School of Medicine. Between 2007 and 2012, he was professor of neurology and psychiatry at Columbia University, where he also held the position of “Columbia Artist”. Before that, he spent many years on the clinical faculty of Yeshiva University‘s Albert Einstein College of Medicine. He also holds the position of visiting professor at the United Kingdom’s University of Warwick. Sacks is the author of numerous best-selling books, including several collections of case studies of people with neurological disorders. His 1973 book Awakenings was adapted into an Academy Award-nominated film of the same name in 1990 starring Robin Williams and Robert De Niro. He and his book Musicophilia: Tales of Music and the Brain were the subject of “Musical Minds“, an episode of the PBS series Nova. In the first video below in the 11th clip in this series are his words and my response is below them. I’m a quiet, old Jewish atheist. I’m not a militant atheist. I don’t argue about things like Dawkins and Dennett and Sam Harris. I quite like their books, but I’m not militant by nature, and I’m not very argumentative by nature. If people want to believe, then let them believe – that’s their business…What concerns me is when belief is used to influence and corrupt educational politics. It seems to me MONSTROUS that Creationism or so-called Intelligent Design is taught next to Evolution, or instead of it. I do think of it as a form of MADNESS. Previously I gave you FOUR PIECES OF HISTORICAL EVIDENCE THAT INDICATES THE BIBLE SEEMS TO BE HISTORICALLY ACCURATE AND THAT INCLUDES OLD TESTAMENT PROPHECY. First, the Old Testament predicted that the Jews would regather from all over the world and form a new reborn nation of Israel. Second, it was also predicted that the nation of Israel would become a stumbling block to the whole world. Third, it was predicted that the Hebrew language would be used again as the Jews first language even though we know in 1948 that Hebrew at that time was a dead language!! !Fourth, it was predicted that the Jews would never again be removed from their land. Let me start off by saying that this is not the first time that I have written you. Earlier I shared several letters of correspondence I had with Carl Sagan, and Antony Flew. Both men were strong believers in evolution as you are today. Instead of talking to you about their views today I wanted to discuss the views of you and Charles Darwin. Quotes like this indicate to me that you are a DOUBTING THOMAS type. When I read the book Charles Darwin: his life told in an autobiographical chapter, and in a selected series of his published letters, I also read a commentary on it by Francis Schaeffer and I wanted to both quote some of Charles Darwin’s own words to you and then include the comments of Francis Schaeffer on those words. I have also enclosed a CD with two messages from Adrian Rogers and Bill Elliff concerning Darwinism.